There are two editions of Apolisoft Font Fitting Room Deluxe available, Standard and Deluxe. The Standard edition has all of the features to manage and preview your both installed and yet to be installed fonts, whereas the Deluxe version provides a flexible set manager tool to organize your fonts for maximum efficiency. It handles the most popular font types used on PC today, helps you to easily add them to and remove from your system. Supported font types include: True Type font(*.ttf, *.ttc), Open Type font(*.ttf, *.ttc,*.otf),PostScript Type 1 font(*.pfm,*.pfb), and Microsoft Windows font(*.fnt, *.fon). • Layout: The layout is easy to understand and configurable. Browsing in a familiar Windows Explorer-like interface make it more intuitive. Tabs used to display font Properties, Character Map or Kerning Pairs can be freely swiched on/off, depending on your needs. • Preview: You can preview the custom sample text in a font list without actually installing them. There are various preview features adjustable: font size, sample string, bold, italic, Underline features, foreground and background color, etc. • Install and Uninstall: You can easily installed a font/fonts from anywhere accessible to system, or uninstall a system font/fonts, with multiple options. • Load/Unload: Fonts can be temporarily loaded into system to be used by other applications for the current session. Unlike installed fonts, when the system restarts, they will not be present. 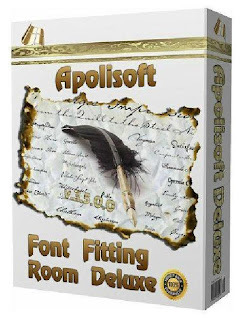 • Font auto activator plug-in for Adobe® Indesign® CS2, CS3,CS4. • Print: To print out the preview font list. • Find: To find text in the preview font list. FFR will not only seach for font name, but also for manufacture, copyRight, and all other text fields avaiable in the column candidates. • Property: 'Properties' tab provides detailed information of the selected font. Each font type has a set of attributes. In addition to general properties like font name, postscript name, copyright, etc., PANOSE and Metric Data also listed in details. 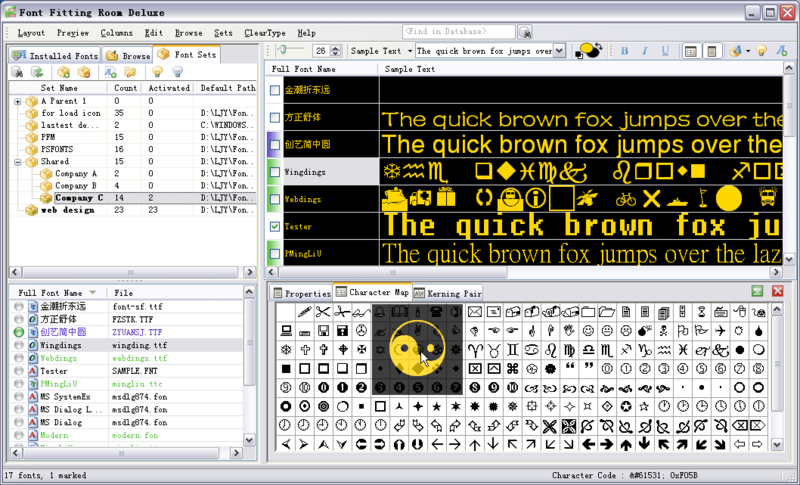 • Character Map: Character Map displays all the supported unicode characters of the selected font, no matter whether it be installed or not. Tool tip is available for each character which gives the unicode and description of the char. Clicking on a character grid to see the magnified char. The character vector shape can be copied to clipboard. • Kerning Pairs: This tab displays all kerning pairs defined in the font, using font preview size to draw each pair of glyphs. • ClearType Tuning: If you are using a LCD monitor, probably you need this ClearType adjusting facility. • Works on Windows 2000/XP/2003/Vista. • Font Sets Management:This feature helps you mark a group of fonts from different places to be treated as a collection set that could be activated or deactivated freely. You can also select a font set for preview without activating it at all. • Font Cache Database:Since database caches all the font properties, there is no need to re-parse each font when working on them, so we get the satisfied speed to preview a set created from a folder containing thousands of fonts. Previewing thousands of fonts in this way greatly saves you time and extends disks life-time. • Search:You can search in whole database or current set, in simple text mode or advanced mode which provides more options including file size, creation date, weight or width class, number of kerning pairs, etc. The search results returned swiftly. • Child-Parent hierarchy set structure provides a highly intuitive way to visually group fonts and supports inheritance. This feature enable you to create children sets under a parent set, sharing fonts in parent set, and managing fonts in a hierarchical way. However you are not required to build such nested sets if the plain flat sets structure is more suitable for you. • Drag-and-drop is supported. You can drag-and-drop a set to move it around, or drag a folder from Explorer and drop in "Font Sets" tab/bar to create a new set. • Shortcuts Ctrl+C, Ctrl+V, Ctrl+X and DEL are supported. You can copy font file/folder from Explorer or "Browse" tab/bar, then paste in "Font Sets" tab/bar to add font records or create a new set. Or, you can copy file records from set, and paste them to Explorer or "Browse" tab/bar to make a backup of those fonts in a new location. Cut/Paste is supported within the sets to help you move font records freely between sets. • New/Open/Save operations are available for set management database file(s), so you are able to work in different place with the same font sets. • Each font set has a "default font path", that is set to the folder of fonts when the font set is empty. The set path can be altered as font files moved around to another place, so as to avoid adding them once more.